This is a dynamic, intense and exigent practice. Breath and movements are also connected together but Ashtanga is quite strict and always has the same sequence in the same order. There are 6 sequences that are well built together as each new posture prepares us for the next one: primary series (yoga Chikitsa), intermediary series (Nadi Shodana) and four advanced series (from A to D). We start with the first one which is the easier and few years later maybe we are able to reach the third or fourth sequence. By practicing Ashtanga, we build awareness with ourselves, our body, our thoughts and feelings, and everything influencing our energy. It enables us to know our limits and to accept them and so it teaches us patience and persistence. By working hard, the sweat which will come from the heat of our body will purify and detoxify our muscles and organs. It improves circulation, calms our mind and builds us a strong and flexible body together with an awareness of our body and its vital energy. We will feel very much alive but also calm and present with the moment at the same time. It helps us to focus into our inner center. The intensity of the poses helps us to keep the mind back into our body and feelings along the poses and transitions. The sage Vamana also said „vina vinyasa yogena asanadin na karayet“ (O yogi, do not practice without vinyasa). Indeed the « Ujjayi » breath, (also called „the ocean breath) is one the main specificities of Ashtanga Yoga, together with the « Drishtis” (viewing direction), the “Bandhas” (internal locks). Practiced together along the sequence they enable to combine alignment, strength and fluidity in each pose. This breath enables the practitioner to maintain a rhythm to his or her practice, take in enough oxygen, and helps build energy to maintain practice, while clearing toxins out of the bodily system. This breath is especially important during transition into and out of asanas (postures), as it helps practitioners to stay present, self-aware and grounded in the practice, which lends it a meditative quality. But beyond a hard and intense practice, Ashtanga Yoga has also a lot more to offer. Actually Ashtanga is a traditional Yoga style popularized by Sri K Pattabhi Jois in the 60-70s and spreaded worldwide for few decades now. Sri K Pattabhi Jois teached in Mysore (South of India) and we also hear about “Mysore Yoga” which is the traditional way of learning Ashtanga yoga, in reference to the Indian city of Phattabi Jois. Pattabhi Jois said « 99 % practice, 1 % theory » and he always remembered us the significance of a regular practice: « Practice and all is coming ». A devoted ashtangi practices 6 days a week, except full moon days and new moon days. 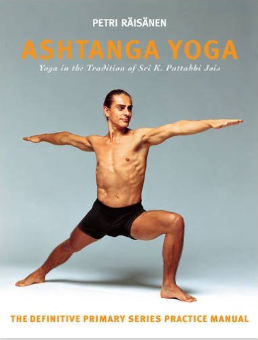 Just do not confuse ashtānga-yoga from Patanjali which refers to any kind of yoga to the Ashtānga Vinyasa Yoga from Shrî K.Pattabhi Jois which is one of the several yoga schools. To go further I would recommended to read the book from Petri Räisänen: “The Yoga Tradition of Sri K. Pattabhi Jois: The Definitive Primary Series Practice Manual” which is really good described and complete. See the Gallery to learn more about the poses.